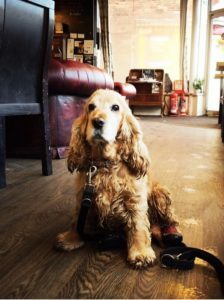 What I love about Perthshire being Dog Friendly is that there are so many fabulous independent local shops, restaurants, cafes and not forgetting the various dog friendly accommodations that are leading the way and showing the benefits of welcoming dogs into their premises. From speaking to dog owners they are spending more time in town not only visiting their favourite shops but also visiting shops they wouldn’t normally go to because they can bring their dog with them. Businesses also say they are seeing lots of positives too with loyal doggy regulars and new visiting more often and customers interacting and talking more because of their dogs. I get messages on a daily basis from people across Scotland (and even England!) wanting to holiday in Perthshire because it’s so dog friendly. They know there are a vast amount of places that will welcome them and their dogs. Perthshire being so dog friendly is not only benefiting us dog owners but dog friendly businesses too.